Abstract: Flat face CRT's have a few advantages over their older counterparts which are not simply cosmetic. 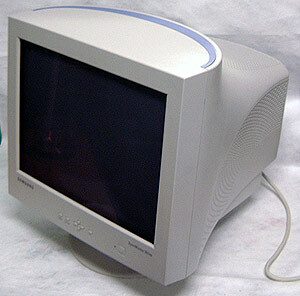 The rise in popularity of the flat screen CRT monitor has fully come to fruition. No longer are flat face CRT's significantly more expensive than their curved-tube counterparts, making them quite affordable, and quite worth getting. Flat face CRT's have a few advantages over their older counterparts which are not simply cosmetic. For starters, they offer better readability and resolution at the outer corners of the screen. The flat glass surface also tends to reflect less ambient light from the surrounding environment which makes the display more pleasant to look at in a well illuminated room. 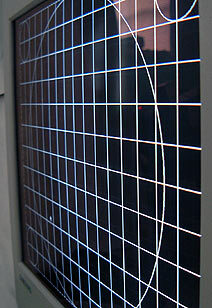 Each manufacturer has their own terms, techniques, and technologies for constructing CRT displays which have a 'flat' slab of glass up front. LG for example have advanced the technology to a point where both the inner and outer surfaces of the display screen are perfectly parallel, yielding arguably one of the best displays of all. Samsung use a couple different methods in their flat face CRT's to achieve the same result. Typically, the inner surface of a Samsung flat face display is slightly curved in just one axis. The Syncmaster 957MB uses such a process so there is only a very subtle curve along the horizontal axis of the inner screen surface. The curve is so small that it's really only noticeable with the aid of a small point light source test. The 19" Samsung Syncmaster 957MB is based upon an Invar Shadow mask screen mesh, features a 0.20mm horizontal dot pitch and an optimal resolution of 1600x1200 @ 75Hz. The screen will support as high as 1920x1440 if you are lucky enough to use a videocard that powerful, but I preferred 1280x1024 @ 90Hz for the purposes of these tests. The low curve, and improved ability to resolve text and images at the outer edges of the display make this monitor quite a pleasure to use. With a dot-pitch of 0.20mm (H), the pixels are fine and offer a very nice picture in return, which makes the 957MB display ideal for drafting and CAD work as much as gaming. The typical power draw is 100W, and in power save (standby) mode that number drops down to just 3W. The 957MB weighs in at 23.5kg, and measures 44x46x46cm in size. Samsung support the Syncmaster 957MB with a three year warranty, and it retails for about $370CDN.. The Samsung 957MB features two things you don't normally find on a monitor - a technology known as "MagicBright" and "Highlight Zone." Though the names of these two features are different, they each involve the same technique of basically cranking up the brightness. When engaged, MagicBright will increase the overall luminance of the display by several orders. The idea is to adjust the brightness of the monitor to suite specific tasks like reading text, playing a video game or watching a DVD on the computer. Under the text setting the brightness of the screen goes down a little to make reading less stressful on the eyes. The other two settings make the screen drastically brighter, and would be great for watching a movie from a distance where dull screens can make it difficult to see dark scenes. The HighlightZone tool is a feature I'm less clear about its intended use... What it does is basically create a small area within the screen which is very bright. The size and position of the brightened area can be moved about, and its shape changed. Intensity, contrast, and even the sharpness of the items within the HighlightZone can be adjusted. As to what importance this plays in day to day computing is not really clear. Pg 2. What makes the 957MB stand out?